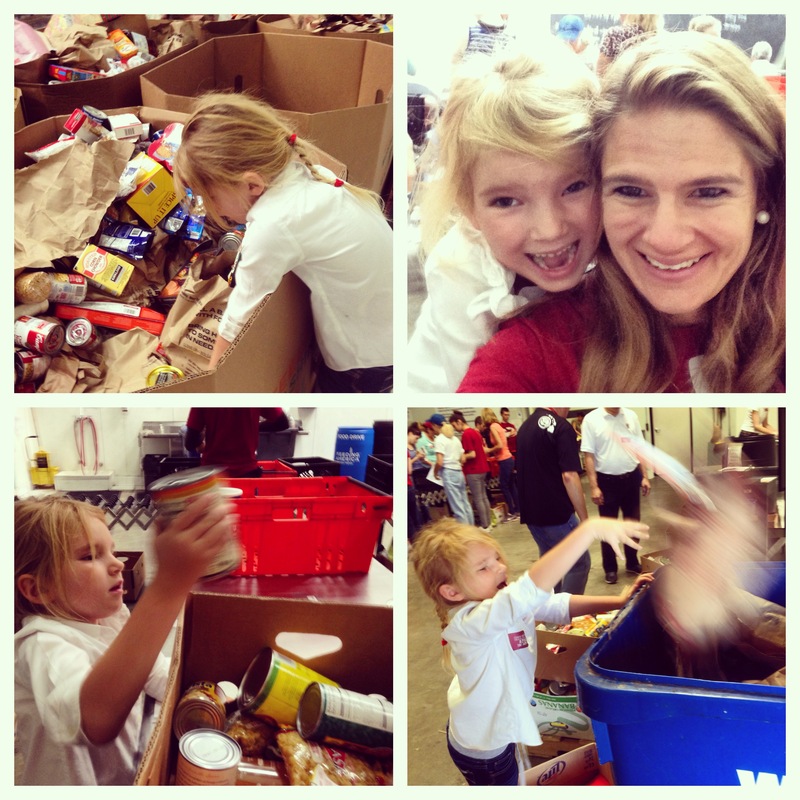 Community service and philanthropy have always been a huge part of who I am as a human being. In high school and college I logged hundreds of volunteer and hands-on hours working for organizations like the Assisteens, Alpha Phi Omega (a co-ed service fraternity), Ravenswood Reads, National Honor Society, Earth Club, Interact, my sorority Chi Omega, etc. Through some of these organizations I had the chance to work for Make a Wish, Habitat for Humanity, and other local groups…basically, if I could get involved, I did. I did not consider my life to be in balance unless I have a consistent philanthropic component. I am an idealist and optimist in every way. We do not need to sit around judging others; we need to get our hands in it and do something to ease the burden with love. We are all part of the same universe. Being of service—and believing in the power of an educated population—hugely factored in to my career choice, as well, as a public high school teacher. But having young children? That I care for all the time and need to bring with me frequently? That has made philanthropy a bit more difficult. Sure, I have donated monetarily to several causes, gifted loved ones with Heifer projects at Christmas, and looked for ways to give from a distance, including giving time to things like vaccination studies, etc. Those donations have been a way to stay true to my ideals, in part, of helping humanity to perpetuate and evolve; none of those overtures are, however, as fulfilling as actually spending hands-on time doing real work for a cause. Finding access to hands-on service is difficult for rogue do-gooders who are not affiliated with groups that typically have long-standing arrangements with philanthropic causes. Believe me, I have done some research. Perhaps not enough. I am working on it. Putting this part of my life back in balance is a priority this coming year. 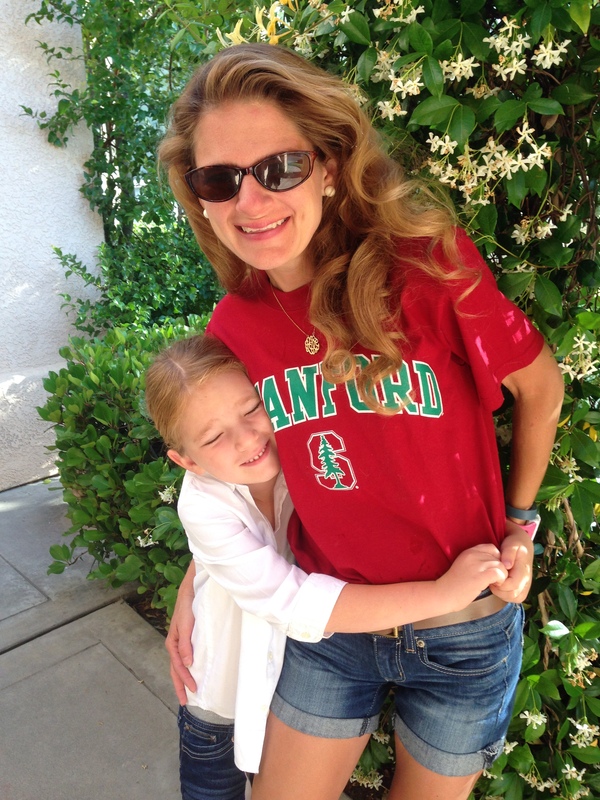 This is especially critical as my children are growing older; a mind and heart for humanist philanthropy starts young. How much can we do to make the world a kinder, more humane place before we die? So when Stanford University, my alma mater, came calling on social media (and our alumni website) with information about this year’s Beyond the Farm day of national community service, I jumped on the opportunity. Alums all over the country stepped out on May 17th to make the world a nicer place to live. We could pick any project we wanted from dozens set up in our area. What a treat! I combed through information for all the projects in Los Angeles, San Diego, and Orange counties and beyond. I wished I could clone myself and work at all of them! I wished that the Stanford Alumni Association would hold one of these a quarter! Most of all, I wished that I had an ongoing project in my life. 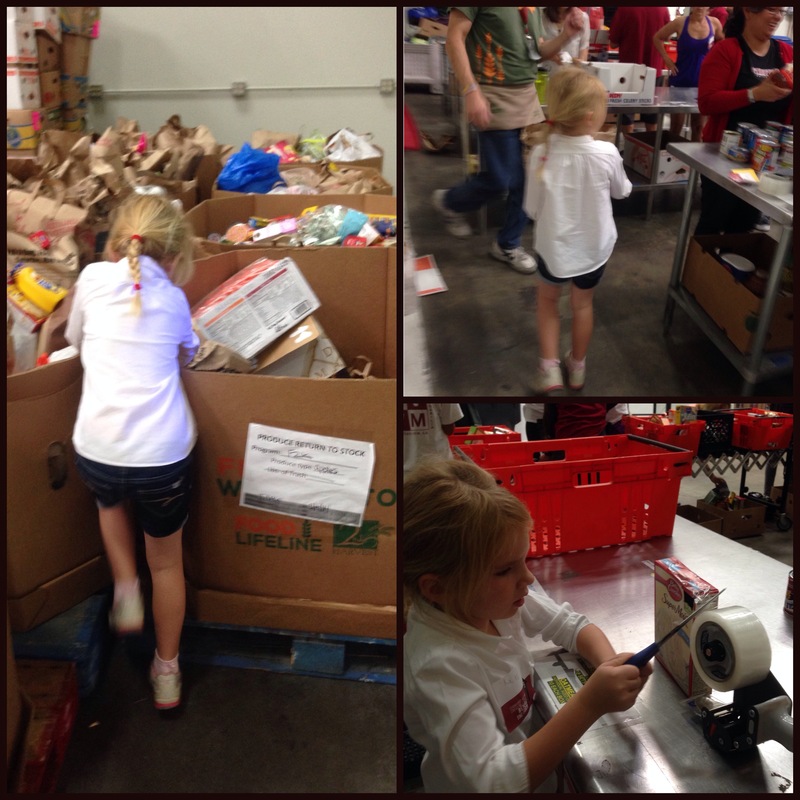 I ended up choosing to work at a food bank in San Diego—Feeding America—because I could bring Katie with me (children 5 and older were invited). I wanted to involve Eric, too, but better one than neither, right? We must use our short lives well, and I want Katie to start understanding what that really entails. Katie has already been part of a few different service opportunities, but this one was really different for her. It was work! And she loved every second. She did not want to leave. She expressed several times wanting to return to help again (which may be a possibility, actually). What could be better than showing up with dozens of other alums on a Saturday morning to do work together to improve the world even just a little bit? We had a choice about which station to work in at Feeding America. After hearing that the “food integrity checkers” would need to be detail-oriented, methodical, and prone to wanting to fix things, Katie wanted to work at that station. We had to take bags of donated food and check every item. Surprisingly, we encountered several items that did not make it through for various reasons (including the obvious, like, hello, an open bag of half-used quinoa). We had to check seals and things like that. If a box was damaged, but the food was sealed inside, we could fix the box. We loved it, and it was a great fit for us. Katie quickly grew independent on this task and excited to fill our bins for the date checkers. Toward the end, we also got to break down boxes and plastic bags and recycle them. She loved that, too. It was an excellent morning. Community service is so much fun! Reppin’ Stanford. Thank you for the opportunity, SAA. I am so proud to be an alum from this university, truly. 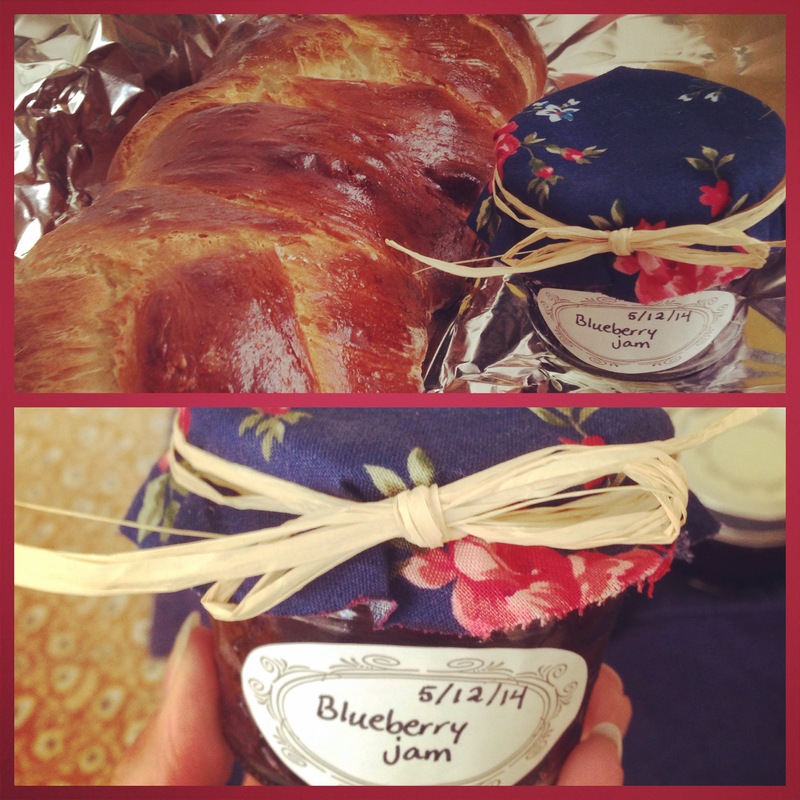 We packaged up some of our blueberry jam and made some challah to give to a family who would benefit from having it. So fun to leave little surprises on doorsteps! I could play Secret Santa all year long, seriously… Is that not the best game, or what? 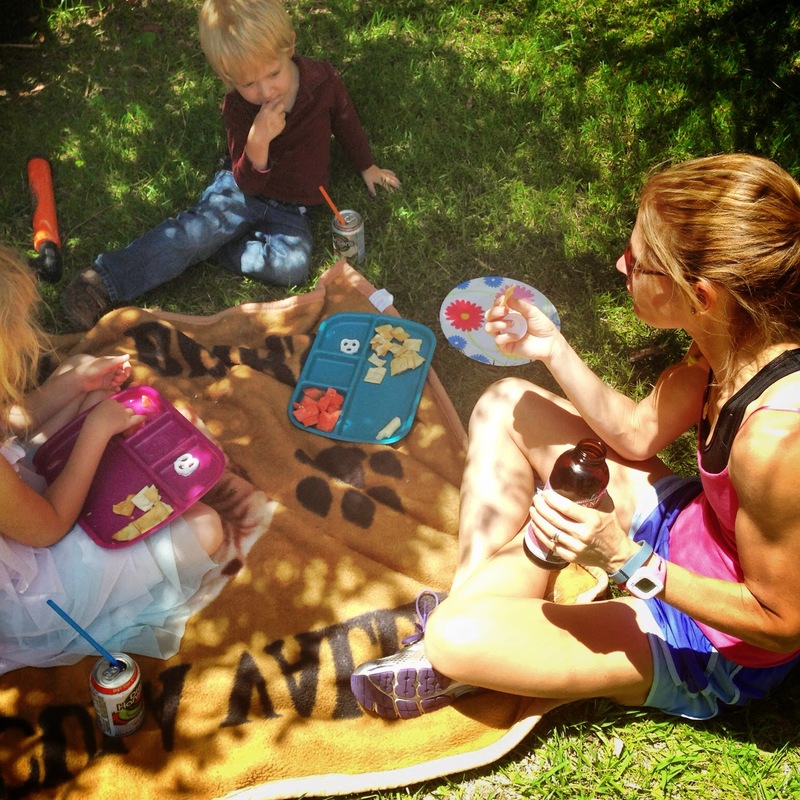 The kiddos and I had our usual Sunday picnic…in our own backyard this time! It was their request, because they wanted to play with some of our water toys. I don’t care where we picnic, I just savor this Sunday picnic time with them so much. 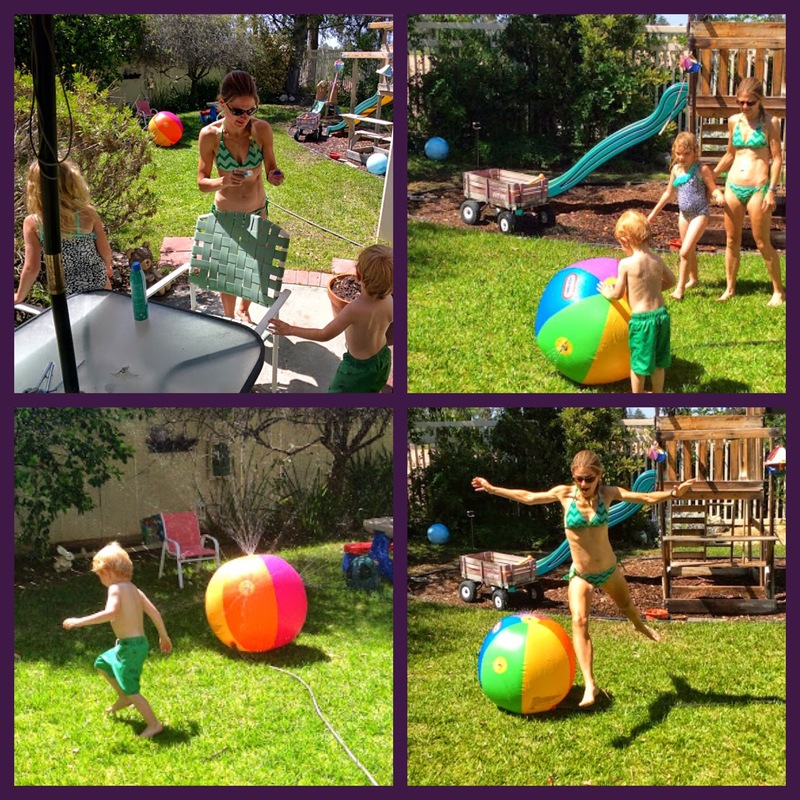 A treat for the coming summer: a big water ball! 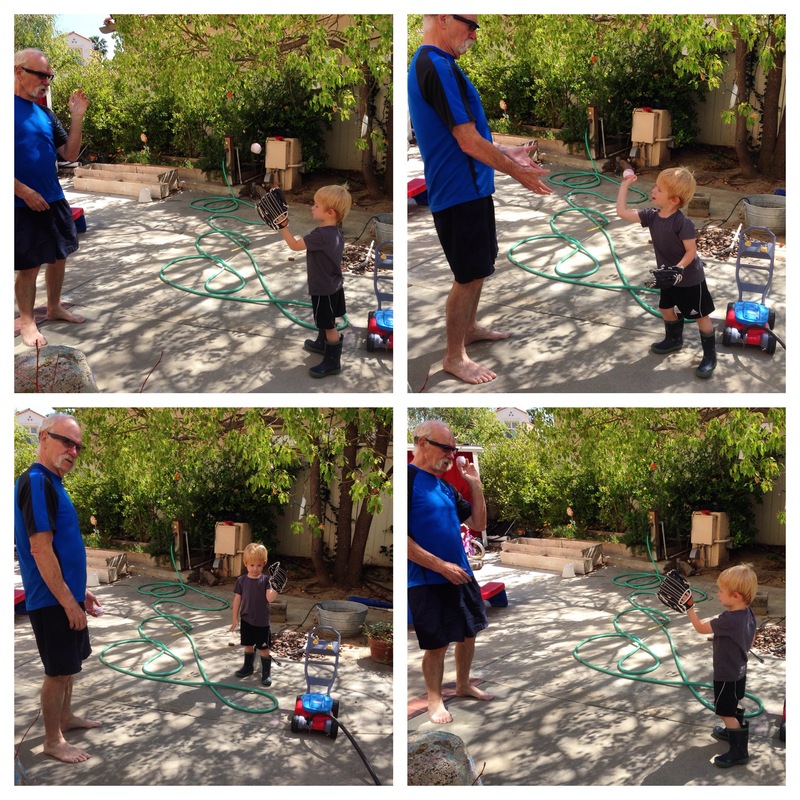 You blow it up, and then attach the hose…and it sprays water everywhere! So fun. We are working on our yard this weekend and week, finally getting some additional herbs and such in. 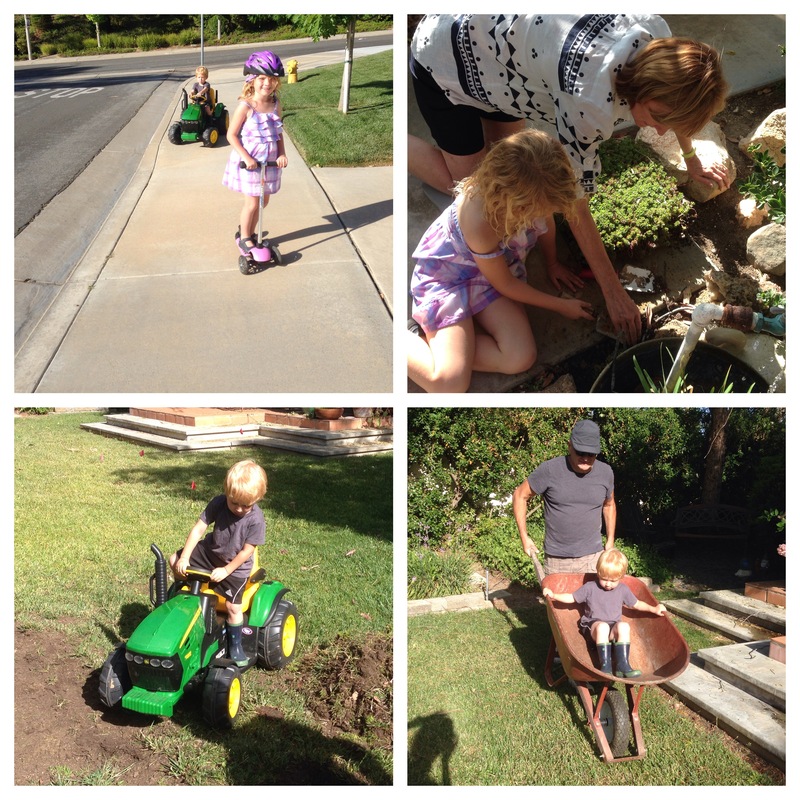 We also took a walk/tractor drive/scooter over to Amie and Boppa’s house to work in their yard a bit this weekend. 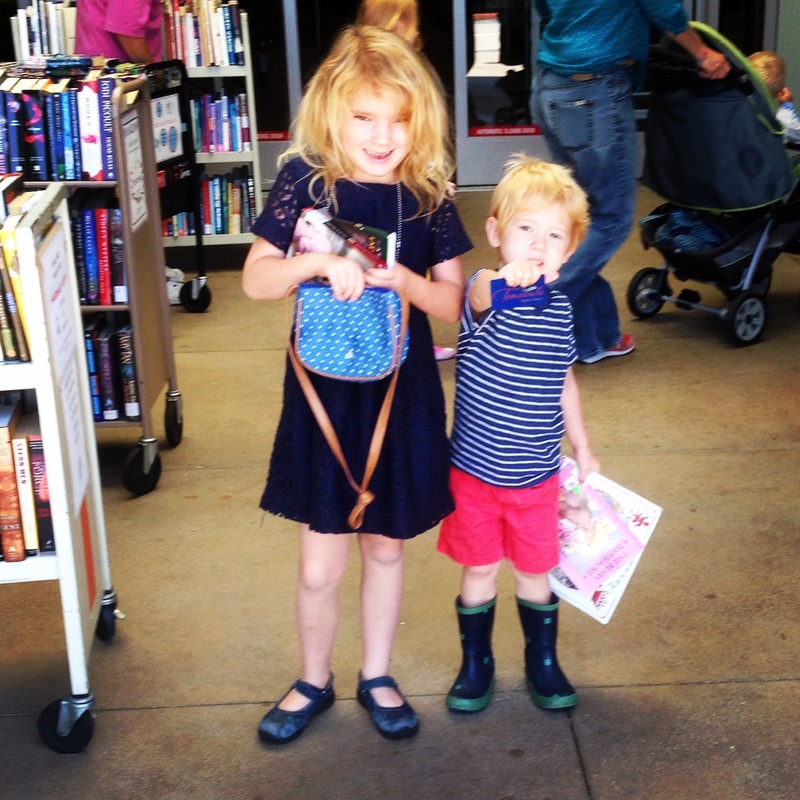 Katie and Eric both got their OWN library cars today! We’ve always just used mine, but I want them to have ownership now over their reading and reading habits. Katie has some goals for a summer of reading, and now that she is able to handle substantial chapter books, even more of the library just opened its world for her. They were so excited to use their cards today. And Bill and Eric had their first game of catch when Eric asked, “Daddy, will you play catch with me?” So sweet. What is that quote again? Do all the good you can, in all the ways you can, as much as you can. Yes. Something like that. And as a part-utilitarian, I would add: for as many people as you can. Do no harm. Celebrate the good. Be of service, not of judgement.